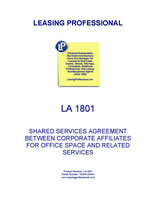 This Shared Services Agreement (the "Agreement") dated as of ___________ by and among Primary Entity, Inc. ("Primary Entity"), a __________ corporation; Affiliated Entity One ("Affiliated Entity One"), a _____________ corporation; Affiliated Entity Two, Inc., a __________ corporation ("Affiliated Entity Two"); Affiliated Entity Three, Inc., a __________ corporation ("Affiliated Entity Three"); Affiliated Entity Four, Inc., a __________ corporation ("Affiliated Entity Four"); and Affiliated Entity Five, Inc., a __________ corporation ("Affiliated Entity Five"). WHEREAS, one or more of the Affiliated Entities provides facilities and services to the other Affiliated Entities and it is the desire of the parties hereto that the provision of such services shall continue, on the terms and subject to the conditions set forth herein. (i) OFFICE SPACE. A portion of the office facility currently occupied by Primary Entity to conduct its business, including, without limitation, utilities, maintenance services, office furnishings and equipment, and other associated facilities and services. The portion of the office facility provided to each Affiliated Entity shall be reasonable in light of the reasonable requirements of Primary Entity and the Affiliated Entities. provided for the Affiliated Entities. (iii) MAILROOM SERVICES. All services necessary to continue current mailroom services, including, without limitation, all licenses, postage meters, postage accounts, postage stamps, courier and express mail delivery services. (iv) TELECOMMUNICATIONS SERVICES. All services necessary to maintain current telecommunications services, including, without limitation, telephones, telephone line services, wireless telephones, wireless services, telephone calls, facsimile equipment and related maintenance contracts and T1 line and service for internet communications. (v) COMPUTER SERVICES. Data processing services and personal computer services, including without limitation data process operators and software for use in connection with such services. (i) OFFICE SPACE. A portion of its office facility including utilities, maintenance services, office furnishing and equipment and other associated facilities and services. The portion of the office facility provided shall be reasonable in light of the reasonable requirements of each Affiliated Entity involved in providing and using such office facility. (ii) ADMINISTRATION. Executive, accounting, administrative and clerical personnel, including but not limited to payroll, payroll taxes, employee benefits comparable to those currently being provided. (c) Primary Entity and each Affiliated Entity providing Services shall use its commercially reasonable efforts to provide the Services required to be provided by it in a timely and efficient manner, and shall assign to each of the Services substantially the same priority as assigned to similar services performed in its own operations. 2.1 The term of this Agreement shall commence as of ____________ and shall continue until __________, unless earlier terminated or extended in accordance with the provisions of this Section 2. 2.2 The term of this Agreement will automatically be extended for additional one-year periods unless terminated by Primary Entity as to one or more Affiliated Entities upon written notice given to the Affiliated Entity to be terminated at least three (3) months prior to the scheduled termination date. 2.3 Any one of the Affiliated Entities, other than Primary Entity, may withdraw from this Agreement, at any time during the term hereof, upon three (3) months' prior written notice to each of the other Affiliated Entities.